This said, I want to introduce a company to you I really enjoy lately. I did get in contact with one of their products when Battlefield-Berlin sent me one bottle of "Normal Rust" and I got convinced by the result I recieved by using it. Modelmates has no shop on its own and is selling via different dealers in different countries. You can find a list of their retailers here! Meanwhile I am happy to announce that Modelmates is now official sponsor of MV Painting Classes and participants on our classes can find out why we like their products that much on their own during the classes. In this review I will take a look on their Primer Sprays. Matt acrylic paint with a fine spray nozzle. For use on plastic, card, timber, moulded acrylic’s, paper, and metal. Flows well into fine indents and panel lines without filling them. Contains high quantity pigment to give a great finish with less amount of spray used. Testing the sprays on different figures ... plastic and metal ones. What I can say is that the fine spray nozzle is really nice. Works very handy and it feels good to spray with them. The surfaces really get a good coverage. As mentioned the pigments are really cool. 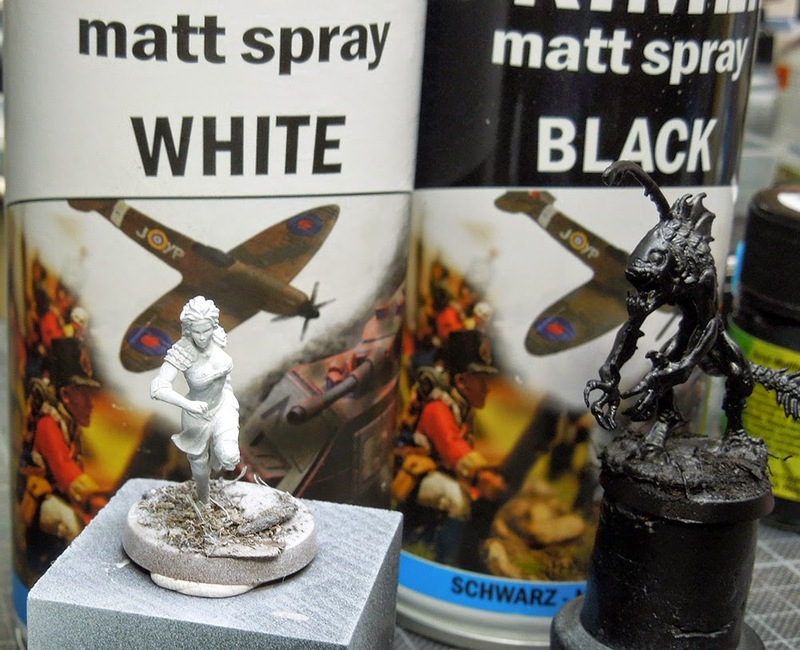 One problem I encountered for our miniature priming: If the figure is too detailed or small you can not do several layers of the spray as it is getting too thick. Unfortanetly we have these troubles with mostly all primers, it can be avoided to prime with the airbrush. I recommand using these sprays only in good ventilated areas. Don't do it in your small basement and stay there. They do dry quick but smell until they are dry. Not more worse than other primers, but I wanted to mention it as this might be a risk for your health. 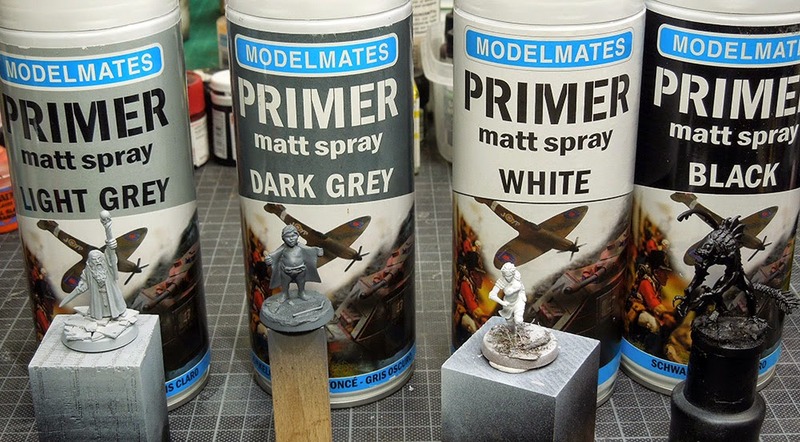 You can even head over to the page of Modelmates to check for "tips" and "how tos" on how using the primer. Now checking in for a closer look. What I can say is that my personal favourite spray is the light grey one. I really enjoy how matte it looks when sprayed and its coverage worked very well on the metal figure. The dark grey works fine too and dries very matte too. Unfortanetly I used it on a plastic figure - a very funny but easy sculpt and it was hard to reach the areas where the cloak and body comes together as it is sculpted kind of "...mkay?" there. The coverage was so good at the darker tone, that I did not try to go for a second run as I feared that the figure's details would get lost. Both examples done with one spray run. You shall not prime your details away!! Again I can say that I enjoyed the white spray too. Dries out really nice and matte, coverage on the metal figure was fine, the base would need another run do be really covered but as the figure and base are stick together I leave the base to some proper base painting work later on. Just too avoid too much coverage on the figure. Done with one spray run. From white to black spray and I have to say "Wow!" ... the black sprays coverage is boom! After the lighter tones I did I did not expect this so covering and strong. There are some areas where I sprayed too much it seems and they become kind of shiny. The areas where I was able to spray only one thin layer where covered and dried out matte but unfortanetly there are some areas they stayed shiny. I think I did too much colour there. I am still fine with how matte it turns out but I know where I did a mistake. Run, the fishman and warbirds are after you! I do like the sprays and the describtion from modelmates fits well. They can easily be used on gaming figures and figures you just want to paint. I think they work great on Scale Models like tanks, cars, planes, trains or even buildings and scenery. I would not choose them if I would prepare a display competition figure. Why? I think they still would work good there but I would be too scared to fail here and spray too much - there I would prefer priming with the airbrush still. Well, so far from their primers ... read you soon with another review! whats the price like? 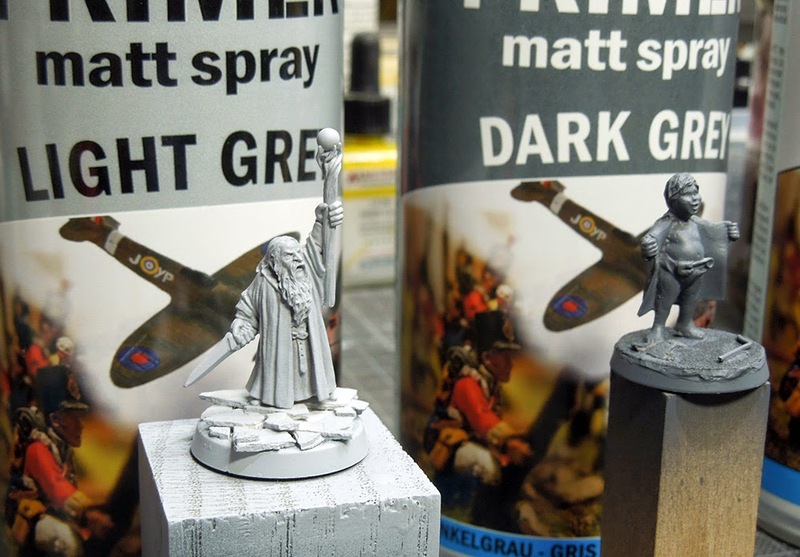 gw primer is now £10 a tin, its just to much for a tin of paint. not even the big paint brands like montana charge such crazy prices. thanks for the review as im looking for an alternative. keep up the good work.